"The Long Trail is an invitation - Mountain high and tree embowered - A free open and easy path that begins where Vermont begins . . . "
Top and Bottom: Typical trail. 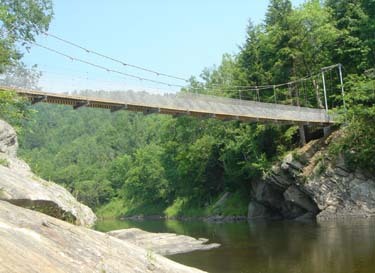 Middle: Long Trail bridge over the Lamoille River. Trails are marked with 2x6 inch blazes painted on trees. 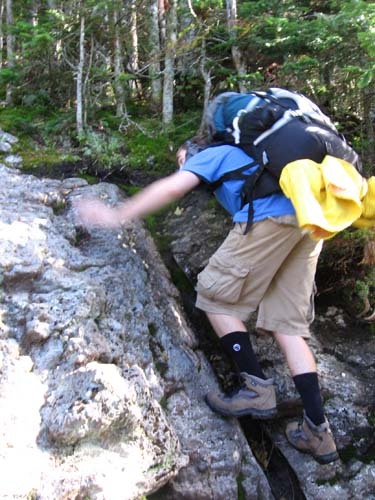 White blazes indicate the Long Trail, and all other trails use blue blazes. Trail junctions have simple routed wooden signs. Just follow the blazes - you'll end up somewhere nice! The Section has four distinct "flavors." First is Beaver Meadow. This is a remote, backcountry bowl, surrounded on three sides by tall ridges and open only to the east. The Beaver Meadow Trail accesses this area from trailhead parking in Morristown and leads to the center of the bowl - an open area which is sometimes a meadow and sometimes a pond depending on the amount of beaver activity lately. From the center of the bowl, two trails lead steeply up to the Sterling Ridge; the Chilcoot Trail and the Whiteface Trail. Second is the Sterling Ridge itself. The Long Trail runs along the high point of the ridge, with numerous good views from Morse Mt. and Whiteface Mt. 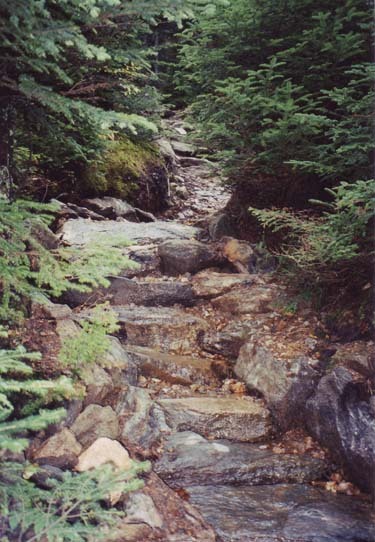 The trail here can be reached by hiking up from Beaver Meadow, or by parking farther south at the trailhead parking on Route 108 in Smugglers Notch. Finally, the trail turns off the West Settlement Road on to the Lamoille Valley Rail Trail. This is a multi use trail created from a former railroad. Leaving the railbed, the trail crosses a hay field and reaches the trailhead parking at Route 15. North of the parking is another hay field, then a small but grand piece of forest along the banks of the Lamoille, and finally a large suspension bridge over the river. All in all, it's a pretty good trail - we look forward to seeing you out there!